Awesome super heros jumpy house. Kids love batman, superman, green lantern, flash and wonder woman. 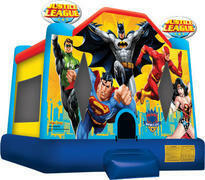 Justice league bouncy house for rental. Perfect moonwalk for your little super hero! This is the smallest bounce house we rent. It is 10 feet x 10 feet perfect for small backyards.